The same night he got up and took his two wives, his two maids, and his eleven children, and crossed the ford of the Jabbok. He took them and sent them across the stream, and likewise everything that he had. Jacob was left alone; and a man wrestled with him until daybreak. When the man saw that he did not prevail against Jacob, he struck him on the hip socket; and Jacob’s hip was put out of joint as he wrestled with him. Then he said, “Let me go, for the day is breaking.” But Jacob said, “I will not let you go, unless you bless me.” So he said to him, “What is your name?” And he said, “Jacob.” Then the man said, “You shall no longer be called Jacob, but Israel, for you have striven with God and with humans, and have prevailed.” Then Jacob asked him, “Please tell me your name.” But he said, “Why is it that you ask my name?” And there he blessed him. So Jacob called the place Peniel, saying, “For I have seen God face to face, and yet my life is preserved.” The Sun rose upon him as he passed Penuel, limping because of his hip. Jacob was left alone. He had sent his entire family, all of his possessions, and his future across the Jabbok river. There he was all alone basking in the glow of the sunset, terrified but hopeful for the morning. Jacob had lived a strange life, but nothing would compare to what was about to happen. Out of nowhere, a strange unnamed man arrived and began to wrestle with Jacob till daybreak. Scripture is rather lacking in details about this epic match, but we can imagine the blood, sweat, and tears that went into this fight. 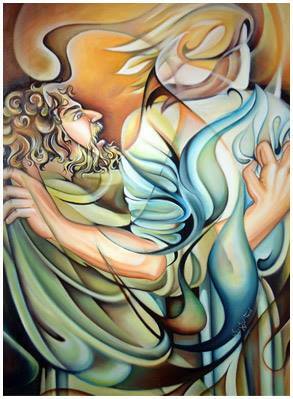 Two men grappling with each other in the bleak conditions of the ancient near east. When it seemed as if one man was finally getting an advantage, the other would return with a defensive move pinning the other one to the ground. This was probably not some glorified hollywood-esque battle, but rather like the ones you used to have with your brother or sister, where no one would relent. Though already having received a remarkable blessing, a new name, a new identity, Jacob further pushes the man, “Tell me your name!” But the man replied, “Why is it that you ask my name?” And there he blessed him. Jacob would later name the place Peniel (which means face-to-face) saying, “For I have seen God face to face, and yet my life is preserved.” And for the rest of his life, Jacob walked with a limp because of his battle with the man. Some theologians are convinced that this narrative has received more scholarship than almost any other story from the Old Testament. Yet, last Sunday, when I casually mentioned this narrative to a few people before church, they remarked that they had never heard about it. In our current culture, we can no longer take for granted the amount of scriptural knowledge everyone has in the church. A lot of people will be quick to blame the laity for not reading enough scripture outside of church, but I believe the fault doubly lays with the clergy who are afraid or unwilling to preach on particular texts. So, if you’ve never heard this story before, or even if its the 100th time you’ve heard a sermon on it, what do you make of it? The first born was Esau, red and covered in hair, and later Jacob who came out gripping the heal of his brother; each of them were named after elements regarding their birth (Esau – red // Jacob – one who grabs the heel). 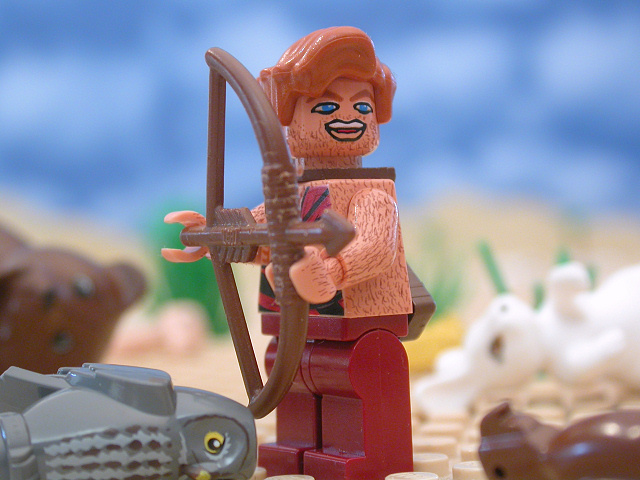 When the boys grew up, Esau was a skillful hunter, a man of the field, while Jacob was a quiet man, living in tents. Isaac loved Esau; but Rebekah loved Jacob. 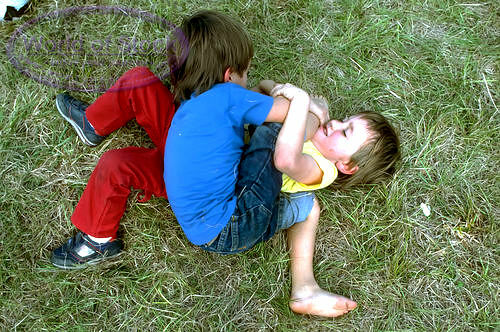 Like most sibling rivalries, Jacob and Esau were combative throughout their lives. You can imagine them as children fighting over simplest little things while the father would side with one, the mother the other. Once, when they were older, Jacob was cooking a stew while Esau came in from the field famished. 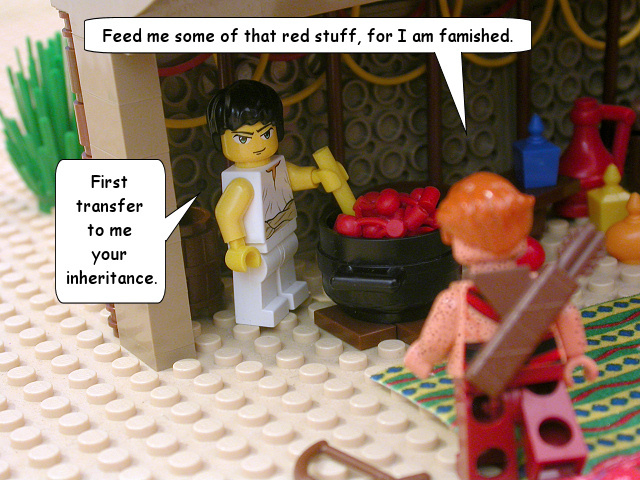 Esau said to to Jacob, “Let me eat some of that red stuff, for I am famished!” Jacob, the cunning heal-grabber that he was, agreed to give his brother food, in exchange for his birthright, and thus Esau gave up his birth right to his younger brother. And then later, when their father Isaac was approaching death, with weakened eyesight, he beckoned for Esau to bring him some wild game in order to bless him before his death. However, when the cunning little heal-grabber found out about this from his mother, he covered himself in fur and deceived his father by pretending to be his brother. Before Jacob had had enough time to even make it away from his father’s tent, Esau returned from the field shocked to discover that Jacob had stolen his blessing. The heal-grabber had gone too far this time and Esau was furious. He vowed to kill his brother after the death of his father. But Rebekah discover Esau’s plot and sent Jacob away to flee from the inevitable wrath of his twin. Years pass. Esau and Jacob continue to live out their lives apart from one another. When it seemed like Jacob might finally be able to forget his past and his brother, he had a vision which made him realize that he needed to return to the land of his father. And so, with all his possessions and children and wives Jacob prepared to encounter his brother, unsure of what would happen. However, the little heel-grabber had one trick left up his sleeve; knowing that his brother would surely kill him, Jacob sent ahead of him all his possessions and family in order to appease Esau before their reunion, while thinking to himself, “I may appease him with presents that go ahead of me, and afterwards I shall see his face; perhaps he will accept me.” Therefore his gifts passed on ahead of him, and he stayed behind alone for the night before meeting his brother in the morning. At this critical moment in his life, at the matrix of what would determine everything forward, spending the night on the border of the Promised land, Jacob struggled with God. So you see, the story of Jacob wrestling with God is placed perfectly within the greater story of Jacob’s life; while anticipating a frightful reunion with his brother Esau, Jacob must first meet with the dreaded stranger of the night and these two meetings are intimately related to one another. During the night, the cool evening when precision and detail are lacking, the divine antagonist arrives and takes on features of others with whom we all struggle during the day. What a man this heal-grabber was! He may have been frightened of the coming repercussions of the reconciliation between he and his brother, and he may have been afraid of the almighty Lord, but in the fray he held his own with either one. This is no ordinary story. In a way, what Jacob experienced was a magnificent defeat. A defeat because Jacob is left with a limp for the rest of his life, and magnificent in his ability to prevail. From that day forward Jacob limped every day to show others (and remind himself) that there are no untroubled victories with the Holy One. Yet his limp was also a reminder that he had prevailed in this skirmish between humanity and the divine. It is important to note that this meeting with God, this nighttime wrestling match, did not lead, as we are wont to imagine, to reconciliation, forgiveness, and healing. It resulted in a crippling. There is a dangerous consequence of meeting the divine, resulting in a marking that we will carry throughout the rest of our lives. And so, when the day broke the stranger left a crippled Jacob, now Israel, limping toward his powerful and vengeful brother. Can you imagine how he must have felt? Weak after wrestling all night long, afraid of the coming consequences, isolated from all his family and possessions, sand caught in his eyes, clothing ripped, walking across the deserted landscape toward his brother? When Jacob made his way forward, lessening the space between himself and inevitably, he bowed seven times until he came to his brother. Like the stranger from the night before Esau rushed forward and grappled his brother to the ground, falling upon his neck. However, instead of punches and scrapes, Esau covered his brother with kisses and tears. The juxtaposition of the wrestling in the night with Jacob’s reunion with Esau offers us a warning; God will not be taken lightly or easily. There will be no cheap reconciliations. 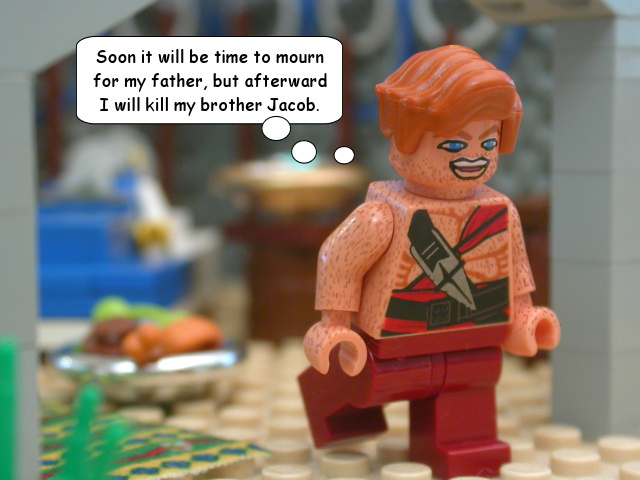 On the way to the affronted brother, Jacob must deal with the crippling and blessing of God. It is easy to take the story in isolation and make it into a simple lesson: “being a Christian is about wrestling with God. There will be times when we cannot understand what it happening and though we are grappling with the divine in a negative, God will positively hold onto us while refusing to let go.” And though that message is true, there is so much more going on with the greater story. Don’t we all have a little Jacob in us? At times we’ve all acted like the little heel-grabber, willing to do less to receive more, willing to focus on ourselves alone rather than those around us. And at the same time, don’t we all have a little Esau in us too? At times we’ve felt betrayed, unloved, and hurt, our trust broken from broken relationships. Being Christian is about wrestling with God, but its also so much more. This story in scripture reveals to us how the love of God and the love of brother belong together. We were never meant to be alone, scavenging for ourselves, removed from others. We were all created in the abundant image of the triune God, made out of unified plurality to be in plurality with others. Like Adam and Eve, like Jacob, like the disciples, and so many other figures from scripture, we want to know the answer to the ultimate question. We want to bridge the gap between us and God. In this passage Jacob wanted to know God’s name, the mystery of heaven and earth, to overcome all the distance. When wrestling, the stranger did not win, but he did not lose either. Jacob gained a great deal, but the depth of God’s being had not been given. The stranger stopped short of giving the ultimate gift – that would have to wait until a cramped night in the crib of a manger in Bethlehem. In a few moments I will be inviting Isabella Bailey-May Sullivan and her family to come forward and gather around the baptismal font. In Isabella’s baptism she will be incorporated into this body here, to learn about these kinds of stories from scripture, to begin a life of wrestling and reconciling with God. Like Isabella, all of us gathered here have been grafted into the story of Israel through Christ’s death on the cross. We will encounter our brokenness through God’s Word but we will also rejoice in the grace that God gives us in spite of our brokenness. And so what are we left to make of this heel-grabber and his wrestling match on the banks of the Jabbok? Like Jacob’s wrestling and Isabella’s baptism, when we enter the church we are marking ourselves for the rest of our lives. It is in this place through the worship of the people and the proclamation of the Word that all the Jacobs of the world become reconciled with the Esaus. Its where we can meet one another and God face-to-face and prevail. We might be brought down in a way that we are truly wrestling and we will walk away marked by God. Though we may not walk with a physical limp, we have been struck by the almighty God in a way that we will never be the same again. And that, is good news. This entry was posted in Old Testament and tagged Jacob and Esau, Old Testament, Preaching, Reconciliation, Wrestling. Bookmark the permalink.